Roulette game is so famous all around the world that people, who actually don't know how to play Roulette, will certainly recognize the Roulette wheel and appearance of the game itself. 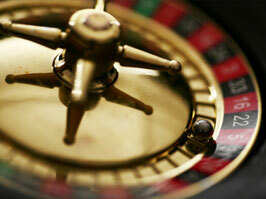 The central part of every roulette table is the wheel, which always consists of 36 black and red numbers. There are also one or two green slots. The amount of the green slots depends on the type of the Roulette. It can be of two types: European, which includes only one zero ("0") slot and American, which includes two of them - zero ("0") and double zero ("00"). During the game the wheel is spun and the ball is sent around the Rolette in the contrary direction. Then the wheel and ball start to stop. The ball will land into one of the slots. The result will show who the winners are. There is a betting area in the Roulette table, which consists of the grid filled and numbers from 1 to 36 with "0" or "0" and "00". Players can do bets on more than one number. It means that there are more possible numbers that could win. The Roulette odds are shown in a ratio form: 35:1, 17:1, 8:1, etc. It means that the bigger the odds are, the more money one will win. So, now it became clearer what makes Roulette game such an interesting, exciting and popular game. Besides, anyone can easily find this game in any casino.